Sustainability hasn’t traditionally been a top concern for school officials. School budgets, the 2 percent tax levy cap, student achievement, curriculum issues, the health and safety of students – these are the types of matters that many board members and school administrators tend to become immersed in. But sustainability ties in to all of these issues. Sustainability initiatives in schools have the potential to lower district operational costs; those savings can then be redirected back into the classroom toward activities related to student achievement. Sustainability can tie into curriculum, and help students better understand science, technology, engineering, mathematics, and a host of different subjects. And sustainability initiatives – such as a school with better air quality – can improve the health of students, and help decrease student absences. All of these types of initiatives lead to more effective teaching and learning. There have long been New Jersey districts and schools that have engaged in innovative projects to advance sustainability. But such efforts were scattered and largely unknown. When approaching the analysis with an open mind, it becomes clear: Greening schools might be the most cost-effective path toward improving school performance. In fact, it might be the only educational-achievement-enhancing path that is also “profitable” (due to energy and operational cost benefits) even without considering the secondary (job creation, student/teacher health) and tertiary (pollution levels, capacity building for energy efficiency and other “green” across the country) benefits. Enter the New Jersey Sustainable Schools Project (NJSSP). In 2011, the New Jersey School Boards Association (NJSBA) helped begin the program with the idea of documenting the impact that sustainability has on schools, capturing the process for implementing sustainable practices, and providing the results to school districts throughout the state. The idea was to enable other districts to replicate those sustainability practices. That same year, NJSBA also began sustainability training for school board members to learn how to integrate sustainability in school operations such as finance, operations and maintenance, curriculum, policy and other areas. Eleven districts participated in the NJSSP, volunteering to share their sustainability practices, undergo additional training and professional development in the topic, and provide data and insights to the NJSSP team. The participating districts included Allamuchy, Cherry Hill (High School West), Highland Park, Holland Township, Medford, Neptune Township (Gables Elementary School), North Brunswick, Ogdensburg, Plumsted, Swedesboro-Woolwich, and West Orange. Each district passed a board resolution and designated a team leader who served as the point person to collect information, participate in professional development, report findings to project managers and other districts, and work with an evaluator for pre-and post-interviews. Sustainable strategies rely on the tenets of collaboration and problem solving. These same tenets provide the foundation used by all high performing districts. Initial training emphasized the importance of collaboration and the need for district leadership to communicate within the school to the respective green team being formed. This was valuable because it demonstrated a broad range of activities and strategies that were considered significant for the school district. John Henry, the NJSSP director, and Kara Angotti, the manager, conducted site visits to the pilot districts and gathered data related to operating costs, student achievement and governance, and, with the district team leader, explored strategies for continued district progress toward measurable goals. It is important to me to make my school green. If we start cleaning up our school, others might follow. If other schools start to follow, then maybe we can convince towns or villages, townships or cities! This would make me happy! In late October, at Workshop 2015, NJSBA unveiled the final report of the New Jersey Sustainable Schools Project (NJSSP). 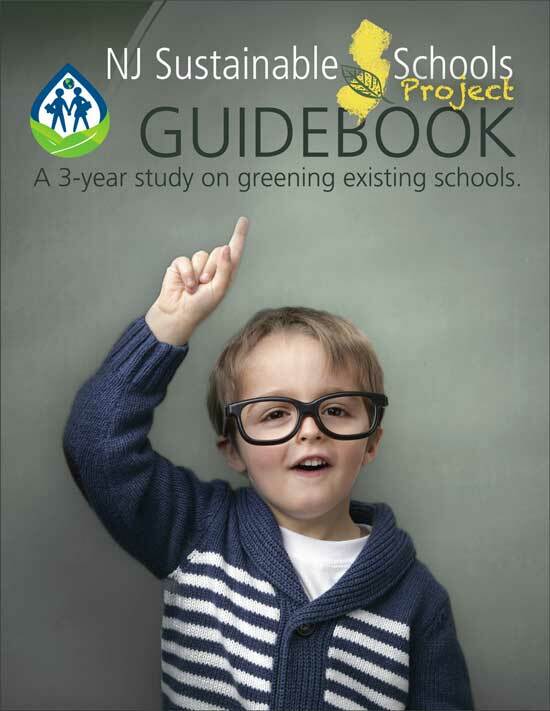 The complete guidebook is available on the NJSBA website in PDF format at the sustainability webpage. Implementing sustainability is not a one-size-fits-all process. Data from multiple schools – urban, suburban and rural – was needed to accurately capture the variety of methods that were successful as well as those that did not work. Success stories, as well as reports about challenges, were key components of the NJSSP. Medford Township Public Schools (MTPS) is on track this year to surpass its goal of reducing energy costs by 5 percent through various conservation measures. For the 2010-2011 school year MTPS’s electric and natural gas spending was $940,181. Last year, 2014-2015, MTPS’s energy spending was $792,094. This represents a 16 percent reduction in gas, electric and natural gas costs. MTPS has saved roughly $592,000 over the past six years. District spending on energy was lower in 2014-2015 than it had been a decade earlier. Since 1998 the district biodiesel use has reduced busing fleet operating expenses by roughly $170,000. Swedesboro-Woolwich estimates it has saved $17,000 by going “paperless” and making the district newsletter and various flyers available electronically. In some districts, the sustainability initiatives have been geared to improving the health of students – a factor that has a documented impact on student achievement. At the Gables Elementary School in Neptune Township, officials are taking steps to improve indoor air quality by upgrading to HEPA (high-efficiency particulate absorption) air filters, replacing carpet and applying low-VOC (volatile organic compound) paint that is routinely used. The school is tracking student asthma incidence by looking at the distribution of nebulizers and inhalers from the nurse to quantify and document the decrease in asthma incidences. NJ Sustainable Schools Project pilot program has been instrumental in helping school leaders understand the monetary, environmental and educational values that green schools provide. The 11 pilot districts and schools that participated in this program have demonstrated leadership by adopting new policies, environmental curriculum standards and efficient operations and maintenance practices. The measurable success of the districts participating in the program has been a springboard to the formation of the new statewide Sustainable Jersey for Schools program. In Allamuchy, a district school redirected cafeteria waste. The composted food waste is used in the school garden, presenting the district with a double bonus – the school doesn’t buy fertilizer for the garden and it pays less in tipping fees to get rid of its garbage. The district saved money and also engaged students in experiential hands-on learning. The NJSSP project team understood that the pilot schools had good intentions to become sustainable, and was well aware that changing behavior in an organization and documenting those changes is not always easy. However, getting to change requires data and positive outcomes that can be replicated, and as always, a dedicated group of green champions willing to commit to becoming a sustainable school. It requires an understanding of the short and long-term benefits for strategically implementing sustainability measures that are unique to the culture of the school and the community, and a clear understanding of the importance of identifying measurable objectives that are realistic and achievable. Another point of importance was to report obstacles so other schools can avoid taking the same actions and wasting time and resources. Register for Sustainable Jersey for Schools. Change is difficult in any dose. Change in behavior is especially difficult. My advice is to never take things personally. So I suggest that you broadcast the change desired through videos, posters, actions, reminders, contests, and anything else that may cause a spark. Be conscious of others and what sits on their plates. Always be respectful. As an immediate next step following the conclusion of the NJSSP, NJSBA has created an opportunity for each member school’s sustainability practices to be assessed. NJSBA is offering members and school district personnel an opportunity to attend a one-day Sustainable Practices Working Session. In this session participants will review a Sustainability Wellness Check, which will be in alignment with the Sustainable Jersey for Schools certification program. There are several sessions planned for February and March. All sessions will take place at the NJSBA headquarters at 413 West State Street, Trenton. The sessions will run from 9:30 a.m. – 3:30 p.m. with registration beginning at 9 a.m. The sessions are free and include a continental breakfast, lunch, and program materials. Pre-registration is required and seats are limited. Districts are encouraged to send their entire green teams. Select a program date to register for a session. Following the Sustainable Practices Working Session, member schools and districts will have the opportunity to dig in deeper and contract with NJSBA sustainability specialist and experts from sustainable industries to achieve the goals identified from the working session. John Henry is NJSBA’s iSTEAM and sustainable schools specialist. Marianne Leone is an NJSBA consultant and sustainability coordinator.